Why should I go on a motorcycle guided tour? Motorcycle tours are the fastest way to know the places you like to ride without worry about directions, where to stay, where to put fuel, also adds a layer of security, specially if you are in a remote area, and it's fun! You meet more riders, you make friends and the experience you bring back with can be very unique. Do I need a motorcycle license to go on a ADV tour? 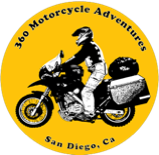 Yes, in California and Mexico you must have a motorcycle endorsement (M1) to ride. It is dangerous ride in Baja California MX? Safety it's a concern from around the world, we feel pretty safe in Baja, we never had any problems, also our customers when we had the rentals, many of them did the trips on there own, not a single complain for safety. What happens if I have a flat tire? Unfortunately flat tires can happen anywhere, you better discuss in advance with the company are you renting for, but we do the best we can to keep you moving, fix on the road, bring to the closest repair shop, or even town if we have to. Same procedure from flat tires, always discuss in advance with the company you are renting for. Can my passenger goes in the chase vehicle? For legal reasons only when it's necessary.